Accede Mold & Tool, a full-service shop under its third-generation of family ownership in Rochester, N.Y., has an extensive history in the production of complex, custom-designed plastic injection molds. In 2007, the company sought to stay ahead of the competition by investing in new vertical machining centers that could expand the shop’s capabilities and provide even greater value to customers. Not only was Accede looking for fast, precise and reliable machinery, but it also wanted to identify a partner that was well known for proven experience and engineering support in producing highly complex molds. Accede evaluated numerous global machine suppliers in its search for high-performance technology. In 2008, representatives from Accede traveled to Japan to visit Makino’s factory. 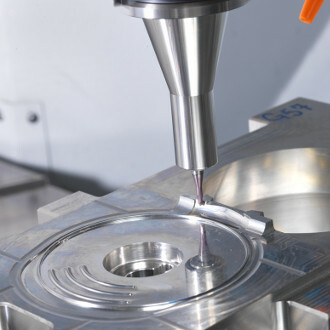 They were inspired by the detail, care and engineering know-how that Makino’s engineers demonstrated, which led Accede to invest in an F5 vertical machining center that would replace two of its commodity machines. Based on the successful implementation, performance and service experienced with the F5, Accede followed up with several additional vertical machining centers to further improve capabilities, including a V33, V56i, PS95 and a second F5. “We believe that you get what you pay for in terms of machine quality, sales and service. We are a small company, and what Makino can offer above and beyond the machine in terms of technical support has proven to be very valuable. We see them as an extension of our resources,” said Brett Lindenmuth, vice president of operations at Accede. Subsequent purchases in the V33, V56i, PS95 and F5 yielded additional improvements in capacity, precision and tool life. With the V33, operators reported nearly double the tool life from that of the initial F5 machine. The V56i investment helped Accede win a new contract for a 30,000-pound mold application over the holidays. Within a week of the transaction, the V56i was up and running, and the machine ran for 96 hours straight on its first run, mostly unattended. Thanks to its new equipment, the 68-person shop is producing more parts than ever before and taking on jobs that it previously had to pass on. Accede achieved a sustainable business environment and improved uptime it originally envisioned, all while reducing lead-times and costs for customers.